At 7:17 on Tuesday evening, as the sun dipped behind Hathorn Hall, the only noise around Garcelon Field was the hum of metal-halide lights. 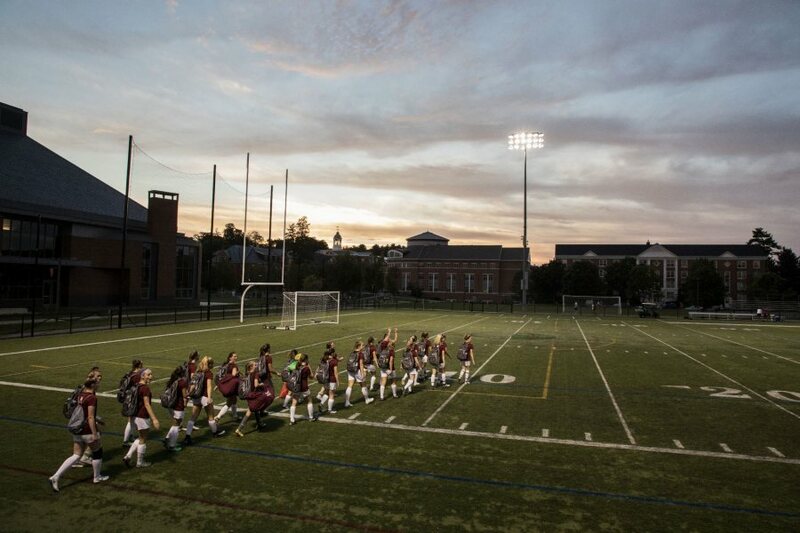 But then came the roar from fans and players as the women’s soccer team took to the turf for Bates’ first varsity contest of the fall season. The energy and spirit of the moment, and the novelty of playing under the lights, were not lost on parent Steve Bogue, who made the four-hour midweek drive from Glastonbury, Conn., to see his daughter Caroline Bogue ’21 and the rest of the Bobcats in their 2018 debut. Some of the Bobcats were making their debuts as college athletes. “A rush of excitement and nerves” is how Emma Lombardo, a first-year from Warren, N.J., described the moment that Kelsy tapped her to enter the game. And Lombardo scored the team’s first goal. “I couldn’t have scripted it better,” she said, recalling her 11 years of club soccer, four years of high school soccer, college recruiting camps, and tournaments.